When THP attended and covered the 2017 PGA Merchandise Show there was one constant in the majority of putter booths which we took note of, the PuttOut. From that point on, if one follows golf on social media then you know this little training devices has caught fire and shows no sign of slowing anytime soon. But, what exactly is the PuttOut and what does it intend to do? THP was able to get one in hand to answer that. The PuttOut is referred to as the “Pressure Putt Trainer”, and there may be no more apt or straight forward breakdown for just what this training aid is, and what it does. A lot of research went into the design of the PuttOut in order to create a shape that will give a primary target, (the base) as well as a more finite target (micro-target), that give immediate target feedback. 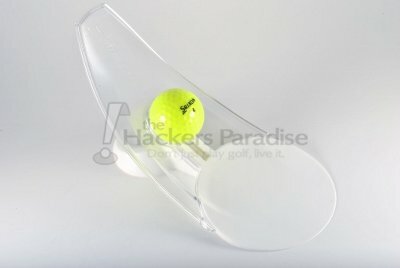 More than that, the shape also serves as helping the golfer work on pace because the ramp is designed so that putts will be returned to the user the same distance that it would have gone past the hole, meaning a more firm put that reaches higher up the ramp will return further to the user and vice-versa. The idea here is being able to practice multiple aspects of your putting while also having multiple areas of easily digestible feedback at the same time. The design is ergonomically impressive but also worth noting is that the materials are equally as such. The PuttOut utilizes a very thick rubber base with micro-spike texture on the bottom to ensure stability and also a front edge that is the exact shape and diameter as a golf hole leading into the heavy plastic ramp. Unlike a lot of training devices, the quality here really is noticeable right out of the box. As is the case with any training device when it comes to golf, nothing is going to work for everyone, nor is it going to cover every single facet of a particular discipline within the game of golf. With that said, a device like the PuttOut excels at improving putting because it offers such a different, yet common sense, type of feedback during use. As mentioned, the dual target setup provide options and difficulty variations that work well. By simply using the base as your target, you have an exact visual of the cup size on the golf course and from there can utilize the ramp-return to fine tune your pace from a variety of distances. Then, if one wants more of a challenge, lower the “micro target” plug on the back of the PuttOut down and then that open target becomes a finite aiming point requiring not only directional but pace precision in order to get the “Perfect Putt”. 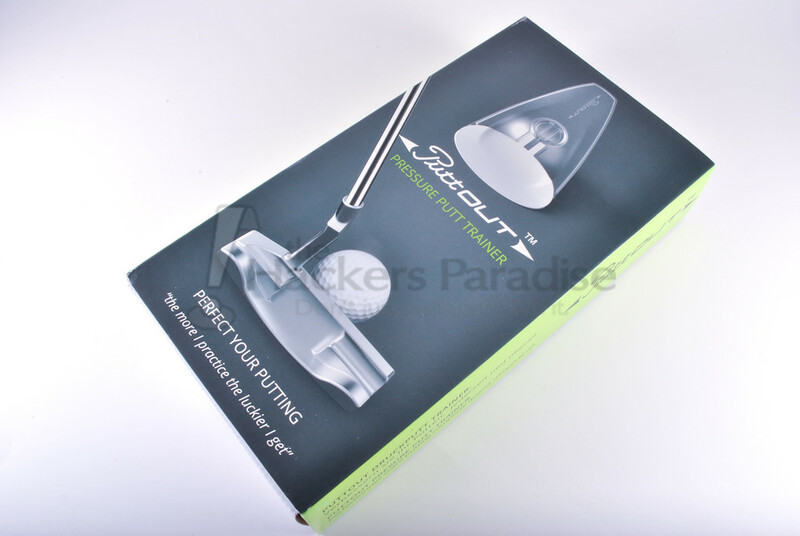 While the PuttOut is not going to replace ruler/coin drills, or be as effective on hard breaking putt practice, it can be used in coordination with a lot of drills and it is the opinion of this reviewer that this makes the device even more useful. Not to mention, while working with the PuttOut it was used on carpet, on a Tour Links putting green, and on the course putting greens while still maintaining the same target and spatial feedback. Sure, the pace will change according to the type/speed of the surface it is being used on, but that is not any different than playing multiple courses, the pace always varies. Moreover, it is worth mentioning again the dual-target that the PuttOut provides in coordination with the ball return/pace-feedback because as the old adage says, “aim small miss small”. While focusing on nailing the perfect putt one loses sight of the fact that they are rolling putts time and again that would fall on the golf course as they cross the cup-sized base target. As has been repeated again and again when it comes to training devices, it is the simplest ones that often make the biggest impact, that is where the PuttOut falls for this reviewer. That is not a discredit to the amount of work and research that went into the shape/design and getting it just right, rather it is a compliment of the highest regard. The PuttOut does exactly what it claims to do and makes it interesting while doing it. The ability to have multiple facets of feedback, absolute mobility, and a price point of $29.99 make it a relatively low risk and high reward type of device. More information on the PuttOut can be found at www.PuttOut.golf. Watched some videos on this but was waiting for the THP (aka..REAL) review for this device before forming and opinion. Thanks James! Nice review James. I will definitely be trying this guy out! Nice review James. I am interested in this as you said it is great quality for $29.99. But also being able to use it in relation to other drills and the two types of targets really intrigue me, but would also add variation to the practice. This seems like something that would be great to have in the house to work on putts with, since it can be used without other targets. Putting is one of the worst parts of my game right now, and this looks like it could help. Great review, James. Thanks for the info. I’d love to know how immediate the results are. Say I hit 10 putts on the putting green with this and then moved to the real golf hole. How immediate are the results.